The evasion is a free feature of the Goldclub. You can only set evasion for your capital. The troops will leave at the moment of the attack and return 180 seconds after. The troops will only evade if there are NO troops returning home within 10 seconds prior to the attack, with the exception of troops returning from the use of this option. 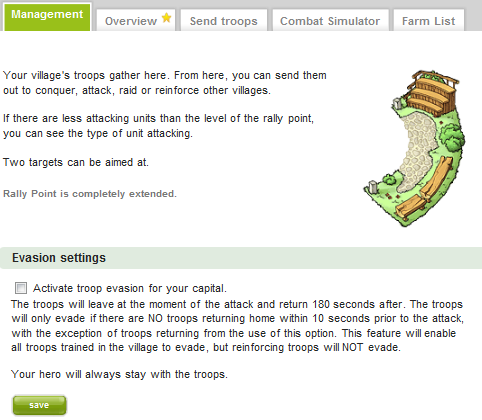 This feature will enable all troops trained in the village to evade, but reinforcing troops will NOT evade. To activate this feature you have to click your rally point. At the point “Management” you find the option “Evasion settings”. You can mark the checkbox in front of "activate troop evasion for your capital". Finally you can click “save” to save the settings. With this feature only troops trained in this village but NO reinforcements will evade.